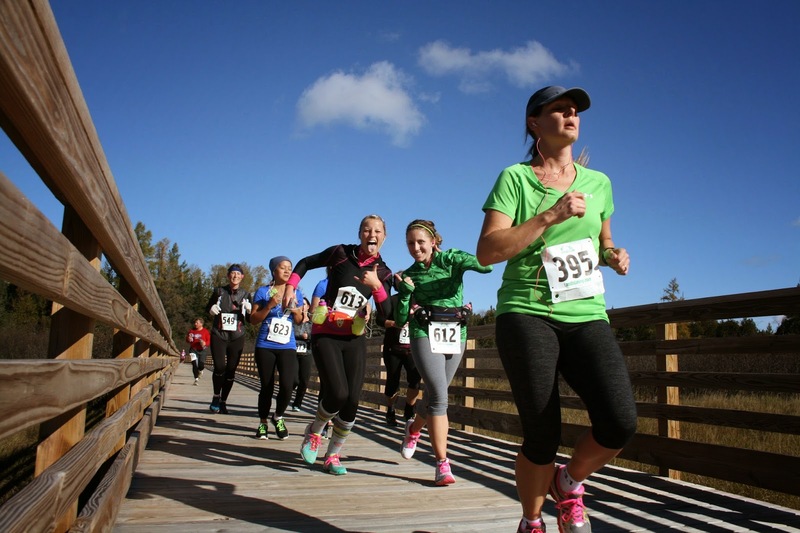 October 11, 2014 marked the 1st Annual Three Eagle Half Marathon & 5K. This was a dream that had started more than a year before. Andy and I were renting in Three Lakes, and we would often run the trail, usually the “boring” part nearest Three Lakes. Then I discovered that after 3 miles it turned back into the woods, then Andy found it too. So we biked the trail to DQ as a family, and I ran its entirety many times in training for my marathon (with Andy and Baya biking beside me). We talked about how it should have a race on it – it was near the perfect distance for a Half Marathon. I ran the Ashland Marathon and was disappointed by their trail – it had nothing on ours! I got home and told Andy that we NEEDED to do a race on our trail. I contacted the President of the Foundation of the Three Eagle Trail and got his full support, then gained committee members, and the rest is history in the form of months of planning and work to see the dream come alive last weekend. 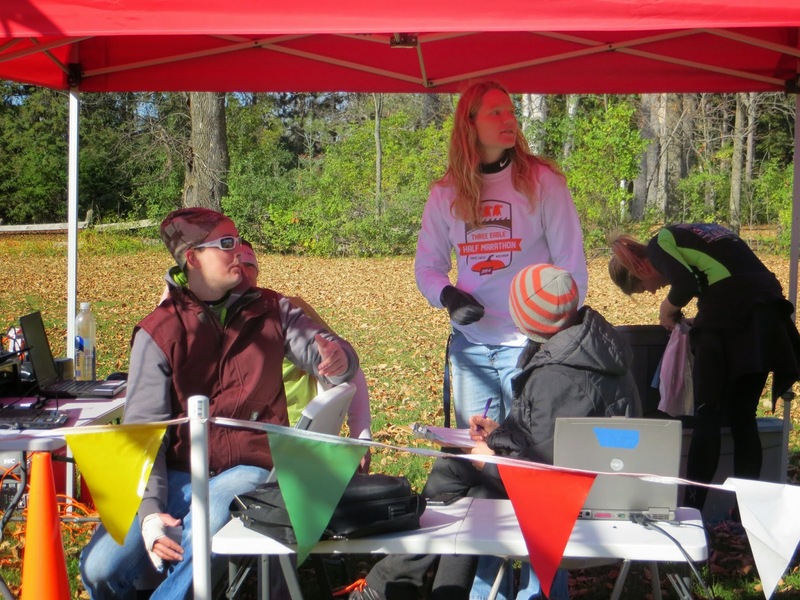 A race director has my absolute respect, especially one of a race that is well organized and run. If it goes smoothly, it is because of an awesome director, committee and volunteers that made it happen. It doesn’t happen on its own. It’s the attention to detail, that if forgotten can make things disastrous. Sponsors, porta potties, aid stations, marketing and publicity (design work all thanks to my hubby), supplies, volunteers, and communication is tops. Don’t forget a single detail – pins for race bibs, cones, signs, medals, shirts, food, water, nothing. Of course there were glitches. After all, this was our first year! We had a shortage of Finisher Medals, and some of the Half runners went off course near the end - my apologies for these things! We worked to remedy them as best and as quickly as possible. We were over 20 Finisher Medals short (5 weeks prior when we had to place our medal order, we had no idea that registration would grow THAT much! ), but many who received an award medal (as well as some other generous finishers) turned their Finisher Medal back in to be given to someone else. There were moments where I felt almost overwhelmed by people’s kindness and generosity. As soon as I heard one person had gone off course, I immediately sent a volunteer down to the turn where some had missed the arrows and cones, to make sure that no one else would do the same. I feel bad for those who went astray, but we worked as quickly as possible to resolve it. We also ran short of cookies, but we had lots of other food left, including quarts of chocolate milk after the finish line that the Wisconsin Milk Marketing Board donated (we wanted to provide the best)! The Three Lakes High School Fab Lab students made our Top Finisher awards. Buses were provided by the Three Lakes Winery, all of our printing was done by Cole Publishing, we had to increase our shirt order, we provided Race Staff shirts, we set up crossing guard training, we painted pumpkins to count down the remaining miles of the course, and we coordinated with T & H Timing Company, and also with Advanced Therapeutics for post-race massages. There are many moving parts in putting together a race of this size. We were blessed with perfect weather. Over 200 ran the entire trail for the Half Marathon that morning, and over 100 additional covered the last 3 miles for the 5K. Over 350 had registered. Minds blown. We were asked multiple times, “And this is your FIRST year?! Wow.” We credit Andy a lot for the professional website and social media work that he did. We credit the people of our small town for their incredible support, and word-of-mouth about our “hidden gem” of a trail. I credit my race committee for all their work in spreading the word. We did have some negative feedback, but very little in comparison to the positive feedback, such as…. The night before the race, I found out that one of our assigned aid stations fell through, but a local family agreed to fill-in and take it on at the last minute. I was also able to be at the finish for most of the Half for giving out the medals, and after one lady finished, her friend hugged her with tears in her eyes and told her how proud she was of her. It was the first Half for some, maybe a first 5K, but I hope that we gave everyone an incredible experience and they’ll want to return again next year – with all of their friends, and that we grow into a community of active living and healthy lifestyles. Did I sleep the night before? Hardly. But for all the stress and anxiety, there were all of these beautiful moments. Driving back from the start towards the finish line area, I saw over 100 5K’ers on the trail and it brought tears to my eyes. It was beautiful. It was worth it.